We didn't expect to have animals on the Valhalla property until appropriate facilities for them can be built, yet sometimes fate has a way of making it's own way. 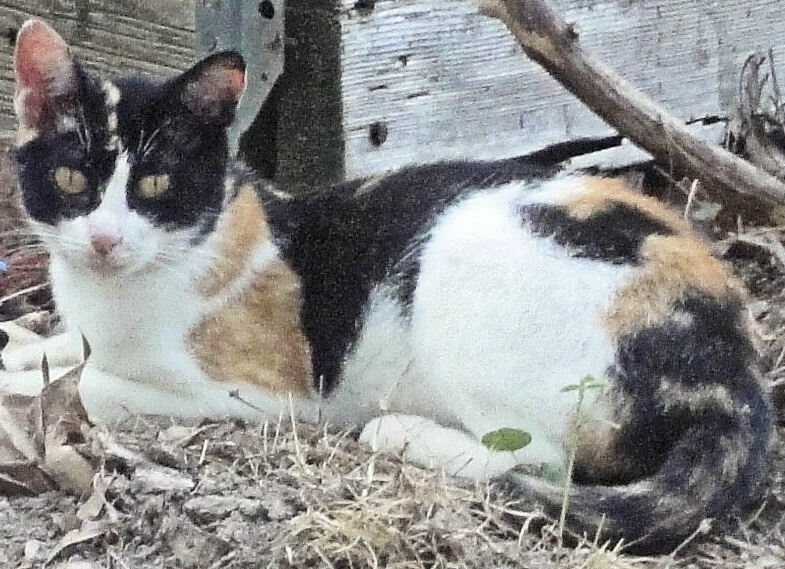 It turns out that there is a little Calico cat already living in a hole under the small shed at the back of the house. Catching her may be out of the question since she's extremely shy and promptly dives deep into the hole under the shed when approached. However, she's also very hungry and Gordon finally managed to get her to eat from a can that he held out in his hand. What is the correct thing to do in this kind of circumstance? We'll try to make friends with her for a month or so before capturing her in a live trap for a trip to the vet for shots, debugging, a medical checkup, and whatever else is necessary. For the record, the cat was the subject of a Valhalla founding Board of Directors discussion that resulted in Theo Polet suggesting the name "Vixen" and Tom Lombardo seconding the notion that a cat will be an important player in the Rodent Wars (although to her credit, there are no signs at all of rodents on the property... since she was so hungry one might assume that she's already eaten them all).